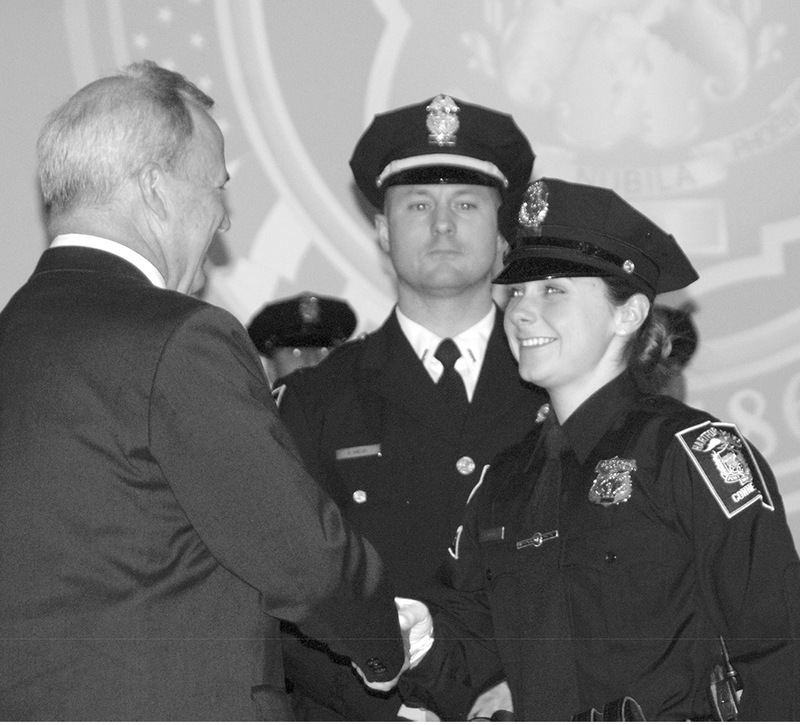 New police recruit Kate Butler shares a handshake with her father after he pinned her new badge; a quick hug followed. Hartford Police Academy Commander Lt. Robert Shelby stands behind them. Suffield’s Kate Butler taught in Manchester briefly after her studies at Eastern Connecticut State University (Class of 2017) focused on education and history, but she decided to follow in the family footsteps and is now a “fourth generation crime fighter.” That’s the inscription in the nice shadow box her father, Matt Butler, presented to her shortly after her graduation from the Hartford Police Academy as a new hire of the Hartford Police Department. The centerpiece of her father’s shadow box was his own badge as a Special Agent of the Naval Criminal Investigative Service, from which he had retired as Agent in Charge of the NCIS Training Academy in Georgia after a long career in responsible NCIS positions all over the world. Kate’s paternal uncle, Dan Butler, spent seven years as deputy assistant director of the NCIS, then became executive director of the USAF Office of Special Investigation. And their father was also in law enforcement, as was Kate’s great-grandfather. Her maternal grandfather, Dr. James Pattillo, served five years as the Suffield health officer. Kate’s graduation was held in the Aetna auditorium, a 1,000-seat facility deep in the heart of the Aetna building on Farmington Avenue (the largest Colonial Reproduction-style building in the world). The ceremony was an impressive event, with 15 new HPD officers, including four women, plus one officer from Avon. Opening remarks were by Hartford Police Chief David Rosado, who spoke of these recruits’ “responsibility as they enter service at a pivotal time in our national society.” The keynote speaker was Mayor Luke Bronin, who emphasized that the new officers were now role models. He was impressed by the grueling academic, practical, and physical training the 30-week Police Academy program entails. Only one special presentation was made in the ceremony: the Samuel J. Luciano Award, which went to the recruit with the highest grade point average in the class. This went to Suffield’s Kate Butler, whose GPA was 98.9. Later, the Academy commander commented informally on how Kate, a young lady of petite stature, had scampered over the six-foot wall in training as easily as anyone. At Suffield High School (Class of 2013), Kate was a member of the girls swim team. (Her brother Jack was captain of the boys swim team; he’s now at UConn.) In her high school years, Kate was also a member of the Suffield Fire Department Cadet Corps. She intends to continue living in her home in Suffield. Kate is on patrol duty in Hartford now, with her field training officer. She says she’d like to become a detective, and after her police career, she hopes to continue in service somehow, probably involving children.